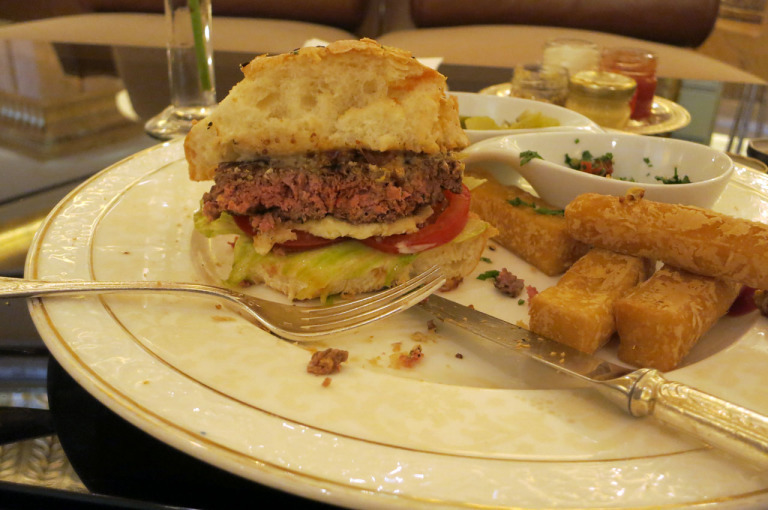 The “legendary camel burger” at the Emirates Palace Hotel is recommended in just about every guide book on Abu Dhabi. Since I have eaten camel meat several times and enjoyed it, this has been on my to-do list for a long time. Last time I stayed at the Emirates Palace I was not able to taste it, so, for my trip to Abu Dhabi this year, I reserved a table at Le Café in the hotel for a tasting. Once there, I ordered a camelchino (espresso with frothy camel milk and date syrup topping), as well as the long-awaited Emirates Palace 24 K gold camel burger. Ultimately, I wanted the full camel flavour. 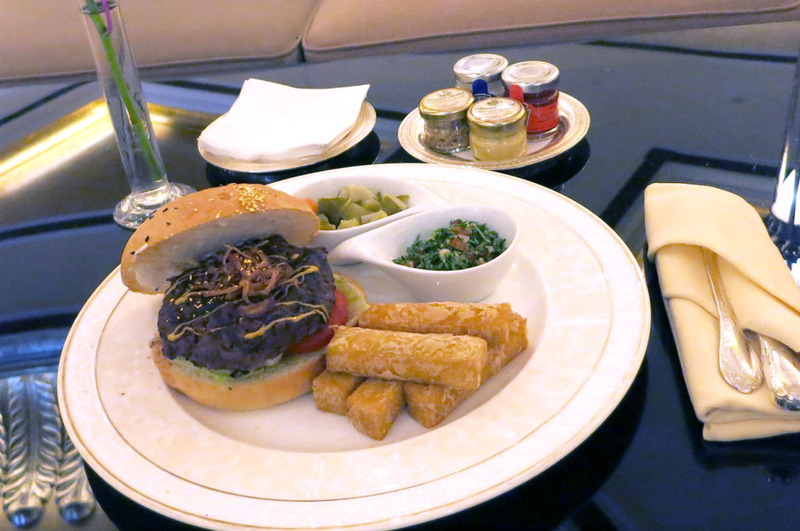 The burger is prepared from camel meat and served with home-made Arabic pickles, traditional tabbouleh, fried onions, mozzarella and chickpea fritters. The bun and the meat are sprinkled with 24-carat gold dust and ketchup, mayonnaise, and two kinds of mustard are served on a separate plate. The burger costs AED 128 including taxes, which is about € 27.50 at current exchange rates. That’s a lot of money for a burger and you would certainly be right to have high expectations. Since I’ve already eaten camel meat several times in my travels, I have very often been asked how this looks and tastes. It is a dark meat, like game, it is low in fat and has a taste somewhere between beef and venison. The patty was perfectly cooked and had a wonderful consistency. The burger harmonised beautifully with the other high quality ingredients and tasted great. The gold dust was actually tasteless and is just there to look good and push up the price of the burger. However, since you do not indulge in such delicious fun often in life, you should treat yourself to the luxury just once. Not only because of the burger, but also because the hotel is also very nice to look at. Camel burger during consumption with cutlery. Many hotels and especially cruise ships offer a trip to the so-called High Tea or Afternoon Tea at the Emirates Palace Hotel. By all means take up one of these offers but be aware that the menu is often fixed and the prices highly inflated. It is far easier to book a table at Le Café (minimum spend fee AED 100; smart casual dress code, sandals perfectly acceptable) by email or phone and take a taxi (very favourably priced in Abu Dhabi) directly to the hotel entrance. This gives you the advantage of not being treated as a member of a tour group, you can move much more freely and, above all, eat and drink what you want. Pictures from my stay at the Emirates Palace Hotel can be found in my “Abu Dhabi 2011” album and from my trip this year in the “Abu Dhabi 2014” album on Flickr.